Dr. Henry Kissinger discusses the future of the Sino-US relationship. The United States and China must establish a new mode of economic and trade relations and dialogue, and work together to solve problems in their relations, a renowned Sino-US relations expert said on Thursday. 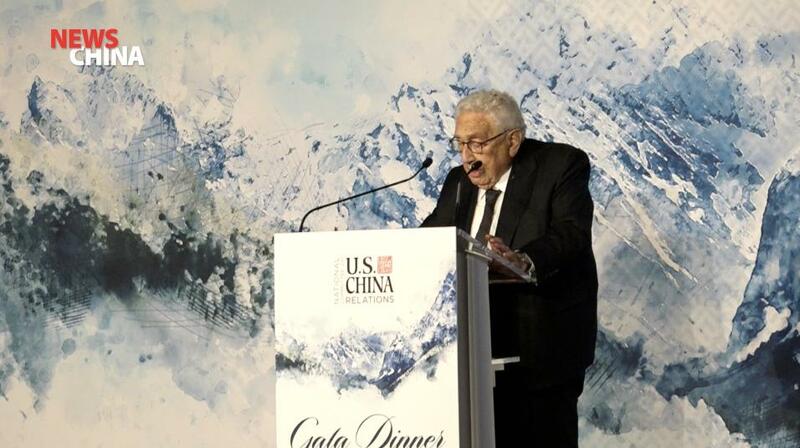 “I think we are now at a moment of fundamental importance in our relationship,” said Dr. Henry Kissinger, the former US Secretary of State, at the US National Committee on US-China Relations (NCUSCR) annual gala dinner in New York City. "The fundamental issue is whether two great countries can live together in a new world for international politics ... in which we find that we emphasize the importance of better relations and the importance of co-existence," said the 95-year-old diplomat and strategist, who just returned from a trip to Beijing. "I think it can be done," Kissinger said. Noting that the relationship between the world's two largest economies is now experiencing difficulties, he said the coexistence of the two nations was possible and their cooperation over the years has proved it. Kissinger said he hoped both sides could act with a firm belief that "the practical problems before us are difficult, but the opportunity before us is to create an international system for the first time in world history in which peace and order are accepted by all the nations." Orlins said that in the end it is the people of the United States and China who will determine the future of the US-China relationship. Chinese Ambassador to the United States Cui Tiankai also called for efforts to achieve more stable and solid development in Sino-US relations. He noted that there has been some questioning or even challenges to that "very good foundation of our relationship," and called for the abandonment of an "outdated Cold War mentality" and "belief in the zero-sum game of great powers." Some 400 guests attended the NCUSCR gala including experts, scholars, officials, diplomats and business leaders.